Tipping in Ireland? The How-To Guide! Do you tip in Ireland? How much should I tip in Ireland? And when should I not tip at all? These are just some of the questions any visitor to the Emerald Isle faces when dining out, enjoying Irish pubs or simply interacting with taxi drivers and hotel staff. Luckily, it is easy to avoid tourist missteps if you understand the local tipping culture in Ireland. In short, there are no set rules for tipping in Ireland. "A Service Charge of x % (or € x) will apply" - this means what it says, your final bill will be subject to an additional charge for service, whether you want it or not. No further tips are necessary. Owners are obliged to display this service charge clearly on the menu and if it is not written here, you can refuse to pay it. "Service included" - this means that the prices are a flat rate and that the owner has factored in a decent wage for his serving staff (actually, Ireland has a legally binding minimal wage). In theory, at least. No tips are required and the prices are final. Strictly speaking. If there is nothing on the menu to indicate that service is included or that a charge will be applied, then waitstaff will usually expect a tip of around ten to fifteen percent. Or a round-up to the nearest sensible amount in bills (in other words, do not leave euro coins - start with the € 5 note as the minimum tip). And don't worry about tipping at all if you are eating Irish fast food. Irish accommodation providers, in general, have factored in all costs no tips are expected. However, you may want to leave €1 - €2 a day for the cleaning staff, and plan to tip for services such as a porter carrying your bags if you have requested assistance. You are not expected to tip excessively in Irish hotels, and no tips are needed if the hotel is small and staffed directly by the owners (such as in a tiny B&B). Again tips are not really expected but no taxi driver, especially in the cities, will object if you offer enough to round up the bill by a little bit. By the way, taxi drivers are obliged to give you a printed receipt as per the taximeter, this will not include tips. If for any reason you need a receipt including tips, ask for an additional handwritten receipt (here the driver will note down that the difference to the printed receipt is due to a tip). If you try to tip in an Irish pub you more than likely earn an incredulous stare - it simply is not done. If you would really like to tip in a pub then you can offer to treat the personnel to a drink, suggesting "have one for yourself". An acceptable answer to this would be "Don't mind if I'll be having it later, do you?" With the bar person pocketing the money instead of drinking on the job. Most of these will have a bowl or other receptacle near the cash register, complete with a subtle reminder that tips are appreciated. These then usually are made up of some loose change and no bills are necessary. Instead of accepting tips, some shops and cafés have one or more collection boxes near the cash register, soliciting alms for some charity or other good cause. If you offer to tip, especially in rural areas, you may be redirected towards these boxes. In the end, there are no hard and fast rules about tipping in Ireland, so the cardinal rule of "Play it by Ear" applies. You will find that quite a few Irish pride themselves in delivering a service for the sake of it, not for an additional tip. Some people will refuse tips even after having to go out of their way. "Oh, it's just part of my job," might be the friendly reply. (Though tips will be more expected in Dublin than anywhere else). And you may also run into the tradition of "luck money", mostly with tradesmen - when this happens, they will charge you the agreed price, say a fifty Euros, and when you hand over two twenties and a tenner they'll press a Euro coin back into your hand. This, in theory, will ensure that you bring your business back to them again. Think of it as a reverse tip in Ireland. On the other hand, there is always a chance that you will come across someone who expected a gratuity. 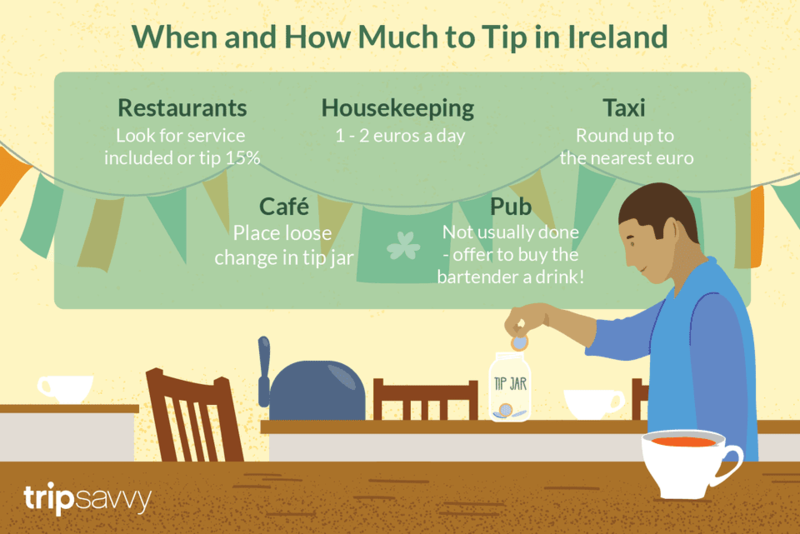 Given there is no strong tipping culture in Ireland, do not feel pressured into leaving too much if you are following the guidelines above. Are Snuff or Chewing Tobacco Products Legal in Ireland?